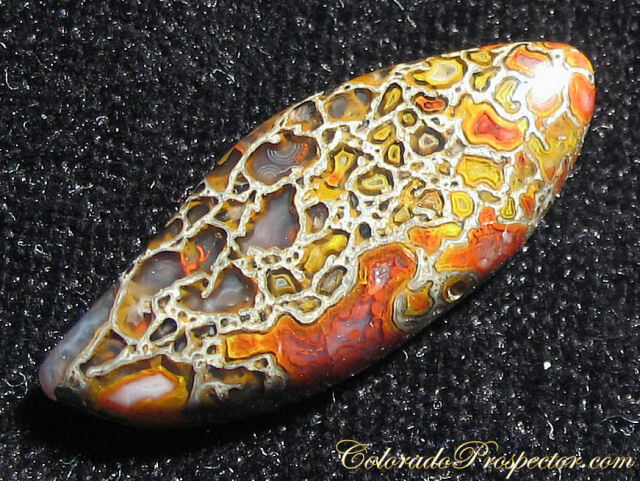 Dinosaur Gem Bone cabochon. 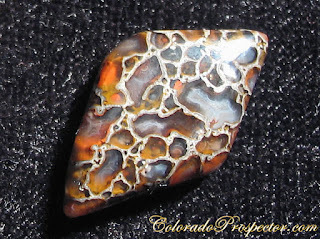 Credit to Dan and Denise Schaefer with ColordoProspector.com. Tiger Eye Click here. While they had names that reflected how they looked like animals. They weren't the remains of animals at all. 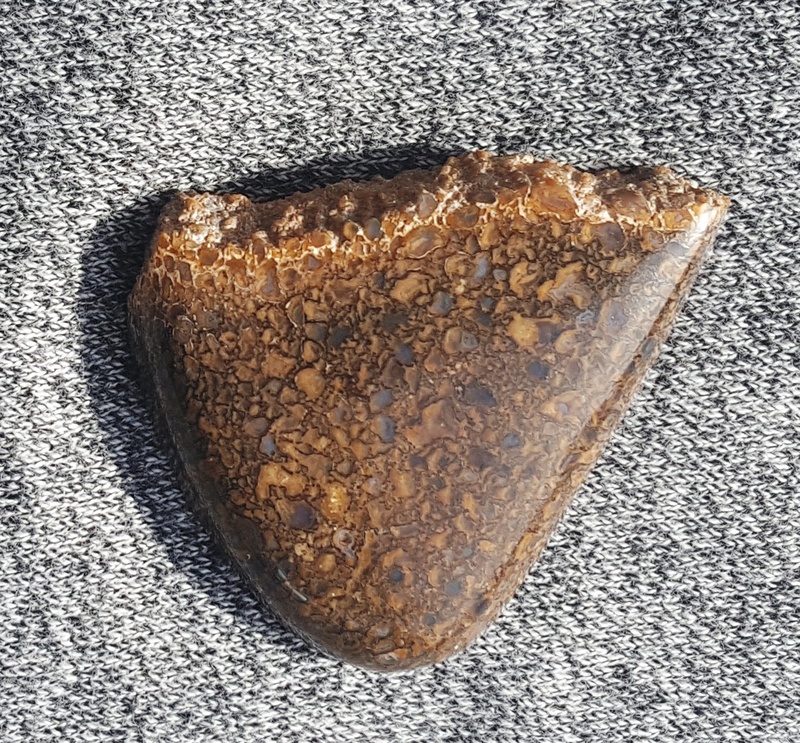 In this blog post, we'll look at cabbing materials that are actually the petrified bone remains of animals. 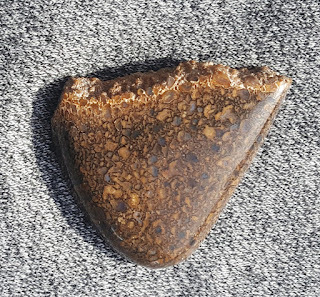 The two I've seen most often are petrified bones allegedly (I've had some sketchy provenance claims from a few sellers at shows) from whales or dinosaurs, but other fossilized bones can be found including sea creatures and land animals. 1. If it is still in matrix, it is probably a different color and texture from the host rock. 2. Try to view the inside of the specimen. If it is solid and the same color as the outside, it's probably just a rock. 3. If you can see a web-like structure, possibly with canals, it is likely to be of biological origin. Bone should not look like a mossy or dendritic pattern. 4. Lick it. Really, don't do this unless you're pretty sure already. Many fossilized bones are very porous and you will feel your tongue stick a bit. Personally, I prefer to gently slide my finger across it. I fell for this slab of unidentified bone the minute I saw it. Not for the golden colors at the top, they are oxidation and dirt and came off easily. The flat side of the slab showed clearly delineated bone structure that has mostly been filled with minerals in the blues and browns. This picture shows a bit of red that isn't really apparent when I worked the material. I picked a rather dark portion to cab away from the edges where it was less friable. I think the colors came out really well. If you can enlarge the image on your screen, you'll see a few empty cells. I could have filled them with epoxy, but I thought it was more visually interesting this way. 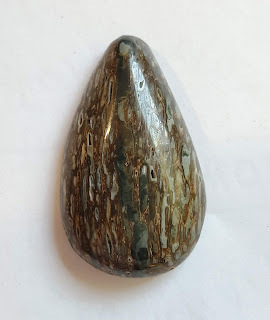 One advantage of working with petrified bone, is that it is a nice medium hardness, This piece took a great polish fairly easily. This free-form cabochon of Dinosaur bone was made by Steve Leidenthal. Notice the rough edge at the top that highlights the natural nature of the specimen. 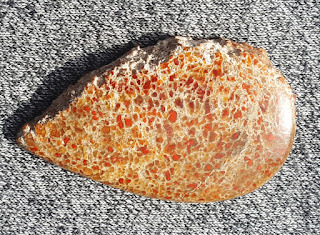 Petrified dino bone like this clearly shows the separations in the soft marrow. I love the bright colors on this one. Steve also made this free-form Whale bone cabochon. It also highlights the original coarse edge of the bone specimen. 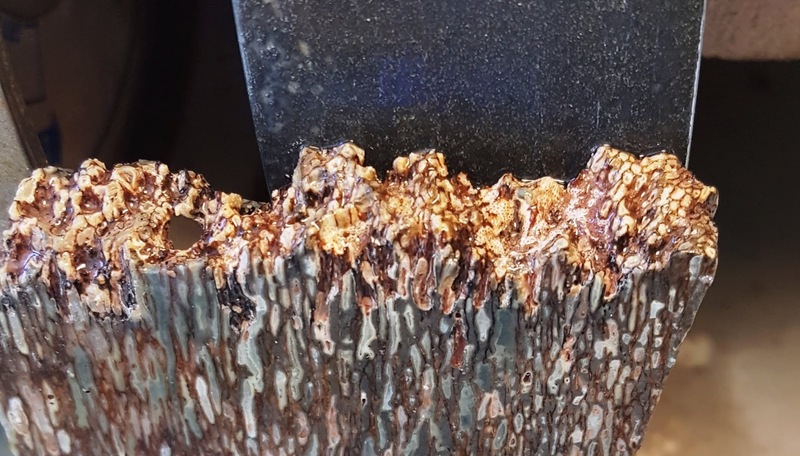 Depending on where the bone was fossilized, it may have been exposed to minerals that can add considerable color--or not. Some remains a dull brown no matter how much you polish it. 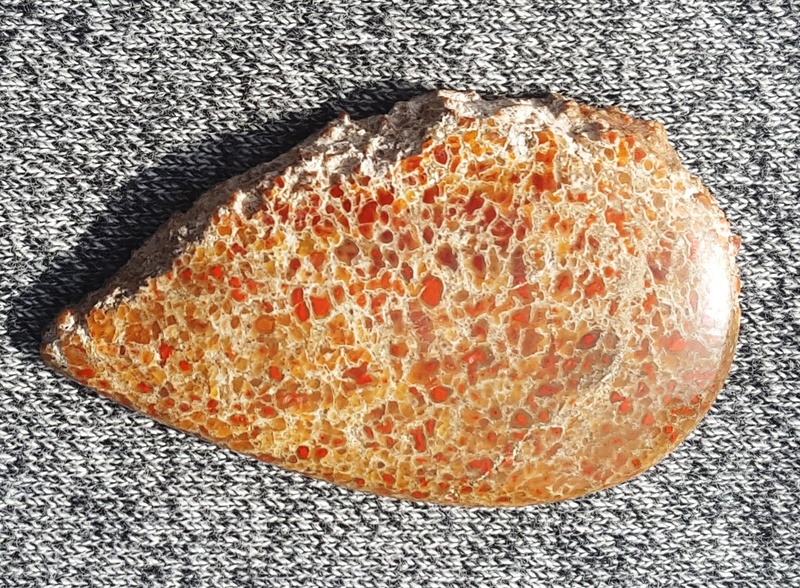 However, on a better specimen you will find red when either Iron or Hematite are found in the petrified bone you are working on. Dan and Denise Schaefer own the web site www.ColoradoProspector.com and they allowed me to use several of their dinosaur gembone images including this one. What incredible color they have! 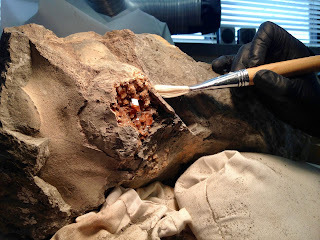 This topic of this post is cabbing petrified bones but I recently saw an image at a program on fossils given by Cristina M. Robins, PhD, Senior Museum Scientist at the University of California Museum of Paleontology that I couldn't resist sharing with you. This image shows a fossilized whale skull and instead of the crystals growing in the bone, they grew inside the skull where the brain had been. Isn't it amazing? Everything in this blog is covered under the copyright laws of the United States including the images. If you wish to use any of the images, please contact the copyright holder which I list as the source of the image. That source has given me permission to use the image in this particular use and no other. If there is no credit line, the image is mine. If you wish to use my blog writings or my images, please either link to my blog or write me at Donna@LapidaryWhisperer.com for permission. Thanks for respecting my work.